Train to run a sub 45 minute 10K Training Program. In order to achieve this, you must be able to run below 4 minutes 30 seconds per kilometer for the distance. Introducing paced running to your program is the main secret to the success of running faster over the 10k distance. You will need to either have a track available or you will need to measure out a 2K training circuit (preferably a loop course). What we are looking at to start with, is being able to run 5Km’s in 4min 20sec per kilometer. This will give you an overall 5K time of 21:40. Added into your training will be sessions at this speed as well. Your components now consist of running at 10K pace, running at 5K pace and then add to this a long run of 1Hr 30min and you are ready to progress towards your objective. Now, the secret to your training should be to balance your training with your lifestyle. Your running must never become too much for you. You must always be able to do the sessions asked of you, if you miss a training session you can’t make it up. There is no going back to make up for what you have missed. Doing this is what normally leads to injuries. Easy running is important for recovery and preparation before a harder day. Easy is at a pace where you are able to talk [“talk-test”] All quality sessions must be preceded with a warm up and stretching, and it is recommended that you warm down as well. This is a 3 week cycle and after every 3 weeks you are able to run a race, up to 15K. It is not recommended that you use this program to race above 15k. If you have raced 21k’s before continue to do so, but do not look to this program to achieve great results, as your long runs in this program are not sufficient for a ‘great’ effort over 21K. After your race day, it is imperative that you use the next 3 days as recovery. 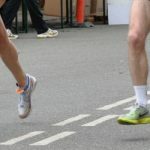 The 5K paced run, you should not run faster than 21:30 on these days. If you want to run a hard 5K then you must do so on the race day. Adhere to this advice for success with the program. Finally, this program is not recommended for a ‘beginner’ was has not got a background of running. It is recommended that you have a reasonable amount of ‘running’ without injury before attempting this program. Further data has been added to the Training section about fartlek, ‘build-ups‘ and methods. I used the sub-45 programme to get my pb down from 52.00 to 44.28 in 4 months, now moving on to the sub-40 programme. i used the sub 50 to bring down my pb from 53 to 47:40, i am going to sub the sub 45, but i doubt i can do it in 4 months. I started a little bit too soon with this schedule and have a few spare days untill race day. What do you suggest is the best training prior to my 10K? Interval or a longer but easier run? Thanks in advance. I was wondering what it means by the longest run? Time on Feet…. I have just start the training program after 2 months out , my thighs are killing me ! I’m currently training for a specialised area in my job and experience some difficulty with my 10k runs. Recently I achieved 46min time for 10km which has since increased to 50mins flat out. I am doing a number of other things such as swimming, weights and cross-fit as the particular area of I’m going for demands an all rounder. My question is does this program achieve the results it claims and could this program be balanced with other training requirements? Hi Aaron, the programs have been used successfully over a number of years however it is the individual who needs to find the balance if they are doing swimming, weight and cross-fit. You may need to prioritise matters as to what is the most important aspect, enjoyment or results. I have been running for many years now, without any plan but more for the pleasure of it. I have a time of 50min for the 10k and I would like to make to 45min. Will this 20 day program make it true? Or do you suggest a longer program, meaning 2 months training. Hi Filipe, if you look on the 10k forum feedback for the programs, you can read how a number have approached the training and how they have got results. run 4x2k then a rest of 90 sec , please help I am a bit confused here. I ran a half marathon early Oct 2013 in 1:42. I had a week or so rest then used this for a 10k early Nov 2013. I took my 10k time from 45:05 down to 42:55! Sub 40 is the target for 2014! What exactly you mean with Rest? I guess is a low pace, but what do you suggest? Around 8min/km ? On the pace development days, shouldn’t I have a 30min warm-up? Hi.. My personal best for 10km is 56min. And i planned to follow this sub 45 running plan. Its posibble? And also, its posibble by training just using treadmill? Many thanks! I’ve completed the sub 45 programme and have run 44:30 3 weeks in a row. I have a race in 3 weeks time and would like to get below 43:30. Can the programme be tweaked so I can train for this? Could someone tell me if on day 15 the start with 3 x 5min @ 10k pace with 1min easyF means I only run 18 minutes? I’d like to thank you for all the informations you put up on this website. I’ve been running for 3 years but never attempted anything serious as far as training goes. I maybe ran 30 times in the last 3 years but have taken courses which quite likely helped me. (agility courses, plyo etc.). Since I doubt you can cut time by just not training! I’d like to improve my time for the 10K as it seems I should be able to get under 45 minutes with the right amount of training. PB is 48. I’ll try this program out, but rest period isn’t something I was doing before, I was going all out everytime I ran which is great fun but not very effective. I read many articles and some forum posts and they were all interesting and helpful. Definitely helped me see how to lower the risk of injury and how doable it actually is with the easy runs to still run but not tire out. In the long run I’d really like to go under 40 minutes and then try for some longer distances. I’m not in any rush to increase my distance though. I’d like to beat my 48 at the end of August. Next would be 45 in May I guess. If possible, I’d like to join the forum since many stories were inspiring and great to follow. Especially Jamieh’s topic with the the ups and downs as one of my far away goal would be to just complete a triathlon someday. I’ve done a sub 50 mins 10k last year but have gone backwards a bit after Christmas and a chest infection earlier this year, I’m running again and improving having done a 53min 10k at the weekend. I would like to have a try of your sub 45 mins 10k program and wondered if you could sign me up to the forum please? I usually go by MichaelH or MichaelH77 if thats taken. 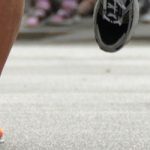 I’ve hit a plateau in my 10k training, and would like to get some feedback through the forums. How can I register for an account? Thank you. I’ve been following your progams for ages and they have always helped me in a big way so thank you very much for all the info and additional follow up advice. I have a situation I hope you can help me with so I’ll give a quick bit of background first. I’m in my late 30s, reasonably fit (not by these forums standards though!) but carry a bit too much weight which I realise has put a bit of extra pressure on bones / muscles etc. I have snapped a hamstring (playing team sports, turning sprinting etc.) a couple of times in the last 7 or 8 years. The second time took a couple of years before I felt out of the woods enough to properly train for 10ks again, which suggests is probably healed badly. I’ve been doing the programs for the last couple of months and am currently doing the sub 45 program (my recent best being around the 46/47 min mark) and I got midway through and did the 5k in about 22:20 as per the program. I felt fine afterwards but the next day my hamstring was aching like mad. I have started running gently again (10 days later) but wondered if I could substitute the faster days (days 3,8, 12) with something else and still improve my time. I find distance isn’t really a problem, the problems come when I up the pace. I enjoy stretching myself at a faster pace but can’t imagine snapping the hamstring again. Sorry it’s so long winded but it’s better you have all the info. Hi Rob, you will need to do exercises to strengthen as well as make the hamstring more flexible. Unfortunately, the hamstring can be quite a difficult injury to get over as the scar tissue causes pain quite a while after the injury. Phil we have added you, did it work out for you? I haven’t written anything here until now. I just wanted to let you know of yet another success story. I trained on the sub-50 program last fall to run a 48:39 in the spring, then moved to the sub-45 program and just ran 43:59 (!) this past weekend. I’m very pleased. I will now be shifting my focus to general fitness (a bit of weight training) before training for my first marathon in the late spring. Thank you sincerely for this invaluable resource and for your impressive follow-up with those who have asked for advice. I have benefited immensely from “listening in” on your coaching tips. I’ve read through a lot of the forum posts the past few days. I am really interested in registering an account. At high school I used to run track, just average nothing special; 400m (best around 50.5 sec) and 800m (best 2.01 min). After school rowed competitively and continued to run for fitness but never raced or built consistent aerobic capacity. In my twenties I tore my acl, had surgery and a couple of years later got chronic fatigue syndrome. Didn’t run at all after around 25y.o. In my thirties I had a lot of back problems, took a few years to sort out. Earlier this year I started running again, now at 41 y.o. First goal was to run 30 min non-stop. Took about 4-5 weeks to do that. Then was away on a trip for 6 weeks, no running. Came back in August and started again. After 4 weeks of training entered a local 10km race, ran last Sunday 14/9/14. My time was 45:30. My goal is to go sub 40 min – should I try the sub 45 min program first, or go to straight to the sub 40 min program? Currently running 6 times a week, comprising 4 easy runs 30-60 mins, 1 tempo run (3 x 5 mins @ 10km pace, 3 min easy), one long run (up to 90 mins). No pain or injuries running now. A little sore after the 10km, but a couple of days later no problems. Thanks heaps for your website. I’d be interested in registering for the forum too if possible. I’ve done the sub 50 programme last month, and had moved onto the sub 45 minute one, but got ill on day 15 and haven’t run since. I was going to try a little run today to see if it’s possible without losing the ability to breathe. My 10k is on Sunday 16th Nov, so I was going to start the sub 45 programme again this week, or would I be best just doing the last two weeks of a programme and then starting again? There aren’t enough weeks left now to fit in two cycles, just one and a half, so I’m not sure what the best plan would be. Nice programme though, I’m fairly sure that before I got ill I was getting a fair bit faster without spending more time training! Perfect scenario for me. Thanks. Hi Naomi, how are things going, would you still like to join the forums? If yes, send an email to info @ time-to-run.com with the username you would like and we shall action it for you. Thank you first of all for all your tips and for this schedule that is very useful and keeps me motivated. I’ve just finished the first cycle and managed to get from 50:30 to 48:15 but I’d like to return back on my PB as fast as I can, hope this will help. I have two questions. 1. Any problem if I run 45 mins instead of 30 during my easy days at 6:00 – 6:30 pace? My muscles don’t protest this at the moment. Any risks in long period? 2. What am I supposed to do after the last 3 days of recovery after the race? Rest one day or two and then restart the cycle? Or should I restart it immediately? What does day 15 mean exactly? Also roughly what pace and distance are we looking at for easy day running? Can you please explain day 15 to me. I really don’t understand it. My personal best is 46:30 in the 10k and recently participated in a half-marathon achieving 1:51:40. The problem is, I didn’t do much practicing in the past two months (after the half marathon). The 10km race is in 3.5 months. Assuming that I’ll try this training program 3 times (2 months), how should I prepare myself for it taking into account my current status? Long runs? Can I please join the forum to discuss future goals and realistic time lines. so happy I found this forum. Hello, hope all is well. I am very impressed by your site and just approach to helping people reach their potential. I am 36, 178 pounds, and been fairly active in terms of working out, soccer bicycling but never actually ran a race until a local Christmas race this year which I ended up doing 44:44 seconds for a 10k. I will joining a local tri-club and plan on doing a few 5k and 10ks in the spring along with a olympic tri in June. I did a 4k trial run and did 17:40 seconds, but felt great and as if i had more in the tank. I wanted to register, my goal is to brake under 40. Should I follow the sub 45 or sub 40 training program for my first cycle? I’ve had sub-40min 10k as a goal for about 12 months now, and was getting close (PB over 10k is 41:25 from last year). Unfortunately I picked up a stress fracture and missed my target race. After 10 weeks off running (did some swimming and cycling) I’m now into week 5 of a 7 week return-to-running plan, and looking forward to training again towards my goals. Question is – where to start? By the end of the return-to-running plan I’ll be running 5 days a week, 1 tempo run, long run 50mins and some strides. I’m not sure I’ll be ready to start with even the sub-45min plan at that stage. Do you have any advice on how to get into condition to start the plan? Also, if possible I would greatly appreciate a forum account as the advice you are giving people in the training threads looks fantastic. I’ve got 2 races coming up that have 5 weeks between them. Last couple of cycles I had 4 weeks between races where I only ran 1 quality run on those first weeks (a 2.4k time attack on the track) combining with some cross-training sessions, light runs, and weights. I’m still not sure if this affected me at all, I was kinda able to pick up where I left off when the cycle restarted on the 2nd weeks, without any sign of sudden improvement or worsening. So I’ll just keep at it unless you suggest to me something else. But, if it’s 5 weeks, I’m not sure how should I plan it. After my first race, (which was a 48 min, slight improvement) i decided to spend the 1st week WITHOUT any quality runs. It was basically some light jogs, weights, pick up soccer games, etc. The 2nd week was the same as the 1st week of my previous cycle, which was 4 weeks instead of 5. And then this program from week 3 onwards. The 2nd race was a disaster. Had too much for my pre race meal. However, i did feel raring to go before week 2 starts. Sort of like well rested kind of feeling. Unlike in previous cycles, where there was this dread when a new cycle was about to begin again. Lol. I was afraid that an extra week of rest might hinder my performance. But it didn’t. Other than the 2nd race, i feel pretty good throughout the program. I am looking at doing this programme but can only fit 3 training sessions in a week on Mondays, Tuesdays and Wednesdays. I play local league football on a Saturday, would the programme still be successfully if I spaced the sessions out or would I be best to look for something different? I currently run 10k in around 50 minutes but due to football commitments I’ve struggled to really improve this. would it be possible to set an an account for the forum? looking to set a pr for 10 k of 45 , and half marathon of 1:40. Quick question on the easy pace – can it be too easy? What sort of time per k or mile would you suggest as a good easy pace? I ran my first half marathon yesterday in 1h 40m . My personal best at a 10k race is 45min.I want to participate at a Half Marathon Race in May. I am thinking of using this program. 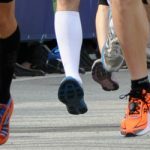 I read somewhere that you can do this program for the half marathon by increasing your longest run “time on feet” to 2 hours. What do you think? My goal is to run the half Marathon under 1h 40m. can i use this program to do under 1h 40min in a semi marathon? This looks like a great plan, I’m starting it tomorrow, I have signed up for a 10km series. 6 races, 3 weeks apart on Sundays. It seems that this is a 22 day training cycle with the race on day 19 followed by 3 easy days. So which day would you recommend I drop to make it a rolling 21 day cycle? What is time on your feet ? I guess it means just run for that long and if so what speed ? Easy distance – what does this mean? Thank you! Great website and lots of information. Looking forward using the sub45 program. PB last months have been 21m07 5k and 46m27 10k. Long time goal is to reach sub40 10k. If I had to take 2 rest days per week instead of 1, taking out the easiest workout would have the least impact I imagine? Love the website, really great information! I am hoping to start this program but need to work out how to fit it in to my schedule, I have two quick questions I was wondering if you could answer? The first is the same as the gentleman above me, if I take one one of the easy 30min run days and replace it with a rest day (so running every week day, no running on weekends) will that completely ruin the training? And secondly, does splitting the 30-40min easy runs into two 15-20min easy runs ruin the training? I cycle 4km to work and home and was wondering if I could just run to work and back as a replacement to the easy runs? first off, doing a 4k time-trial to see where your natural level of fitness is, will help in setting up what pace you run the ‘speed’ sessions at. coming back to your questions: you can have a rest day, but note that Day 3 to Day 8 is important, especially the quality sessions. I have adapted the schedule outlined here around a 4 day running week, I will post my adaptation on your forums if possible, would be interested in your thoughts! Can you suggest a specific pace range for easy runs? I have a question – is it possible to incorporate some rest between days 9 and 10 ? Thank you for reply Ed ! I already run day 9 this morning so my question is whether next day could be rest followed by day 11 – easy 1h. I don´t have problem with running easy runs but when it comes to running at pace day after easy run I feel somehow drained. Is it normal or should I cut some easy running ? 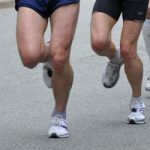 What is the difference between “easy distance” vs “easy run” vs “easy day”? Hi there, easy distance is where you cover the distance without the pressure of pace or heart rate. An easy run, is on feeling and what you perceive as easy. An easy day, the focus is on recovery for the day, so your run is aimed at achieving this. I am reaching 55 years old and am able to do 10k in 50mins. With concern for my knee at my age I only do jogs or runs twice a week between 6 -10k. Is this program suitable for some one of my age to do a sub 45mins for a 10k run? HI there, the program should be suitable but instead start off on the sub 50 minute program and slowly increase the pace and number of intervals before moving onto the sub 45 minute program. once you running 5k in 22.30, then you can consider doing the sub 45 minute program. Great site. Thank you for providing your plans. They’re easy to follow and, for me at least, quite challenging. I went through the plan once through. I failed Day 03 and day 08 workouts. Those paces are hard to maintain. However, I was only taking 1:00 breaks between. I was still able to hit a 22:00 5km but this was at full effort for Day 12. On Day 19 I ran a hilly 10km in 46:37 in moderate intensity. Admittedly, I could have pushed much harder and maybe hit 45 minutes, but I was just getting back from completing a triathlon, and a bacterial chest/sinus infection along with a round of antibiotics. Both 5km and 10km times are my seasonal bests since trying to come back from a serious injury (ruptured ligament in my right foot). I am now working the plan again for the second cycle, but today I failed Day 03, again! I find it very difficult to sustain a 4:25/km pace for 2km regardless of the length of rest I took in between. I should also say, I have to make adjustments to the plan to accommodate biking and swimming and hard HIIT sessions on the bike (heart rate zone 5 for 30 seconds, hard). I’m wondering, since my 10km was 46:37, if I need to tough it out and do the plan for the second round to see my 10km results, or perhaps demote myself and do a different plan that isn’t so taxing on the body in order to train on the bike and swim? Hi, Please could you advise me with this. I planning to Run !0K at the end of May and I would like to improve my previous time 0:47 to at least 0:45. I would like to follow you program but from my lifestyle – i can’t run everyday until the rest day or sometimes difficult to fit the running schedule around my other schedule.. I cycle to work and back 28km each way and have swimming as well once a week. Sometimes i don’t have enough energy to go straight for a fast run (if that what I suppose to follow,lets say) after a bike ride. What would you recommend and is my goal achievable? what do you think of improving the speed by running with some extra weight? Is that efficient? Thank you so much for your time in advance. I’m not sure which programme I should be following. In the past two to three weeks I’ve smashed my time 4 times. In that time alone I’ve managed to cut my time down by exactly 10 minutes from 51:46 to 41:46. I think I may be a natural runner. I think I’ve finally pushed past my limit of 15.5 kph. last 7 yrs racing in triathlon. Last 7 months only swimming and recently started jogging again. Finished 45;51 at LA Turkey Trot a couple of weeks ago, and a couple of days back 40:46 @ 5 miles run. For these past 3 months i have been doing easy runs from 4-8 miles at 9-11 minute pace. I swim 4 days a week and wish to combine a training plan with only 4 days of running. Will I be able to pull it off? To get a plan where I can do a long run, still feel rested to do somespeed? Would love some advice. I have been on the plans for a year now and my 10k has gone down to 47.44 from 58 mins….yeah! However, I have now stalled and I am struggling to get tot he 45 minute target. I did complete the off training period and build up in November so I am not sure what to do now? Any advice would be so gratefully received as I am bit despondent. Hi there, first off, congrats on improving your 10k time, quite an achievement. Also good to see that you have done the off-time and build-up. Don’t become too despondent regarding the improvement, as this does happen, so do stay positive. This is a free service, this way we can hopefully help you achieving your next level. Ah thank you for the reply! I will send an email thankyou and advice would be much appreciated. I do love the structure of the plan and would love to improve thanks again. Thx for the very fast reply. I have been following this to the word – two cycles I have trained and yesterday my target race was the Tenby 10k (Wales). 44mins and 51 secs!! It was a tough course and very windy conditions! I have gone from 59min, 52, 48 and now the 44…I have been training faster also in good conditions, so next step will be the sub 40mins! In this time I have also ran a 20min 49sec 5k last week! 41 years and will beat my age for 10k! I just started this program after my first run. I did a 10k in 48:50. My goal is 45:00 in mid october. Do you think it is a realistic goal? Hello, please help, I’m a pro boxer, I fight 10 rounds x 3mins with 1 min breaks (40 minutes in total). So I figured I’ll use this template for my roadwork training, I also did a 10km run in 48 mins last month so i think this sub 45 min one suits me best. I was wondering if i shoulder make this 3 week program a 6 week one considering I’m training twice a day, or do you have other suggestions? I usually run in the morning and box in the evening, it’s usually 40-60 mins of morning running and 2 hours in the evening, 5-6 days a week. Hello. I’m a regular runner that would like to be a forum member if possible. I’m looking to improve my 10k times. Is it possible to register? First thanks for such very effective programs! I have done program for sub 50 and sub 45 minutes 10k using this site. For sub 45 program I could achieve only 46.44 in one cycle. I am planning to to get sub 45 and in the long run want to move up to sub 40. Admin can you please create account and guide me for this ? Thank you very much. I just started the program, finished day 3 today. I ran 45:43 last year so I think I should succeed in finally breaking the 45. When I look at the last couple of days of the cycle, there is quite a bit of running almost until race day. I have usually cut my running quite a bit in the last week before race day, since I read that it would give the best results. But apparently I have been wrong, will this produce better results than cutting training shortly before the race? This has been asked but never answered, Day three . “Start with” I understand pace and rest but after starting with this what should I do? ?